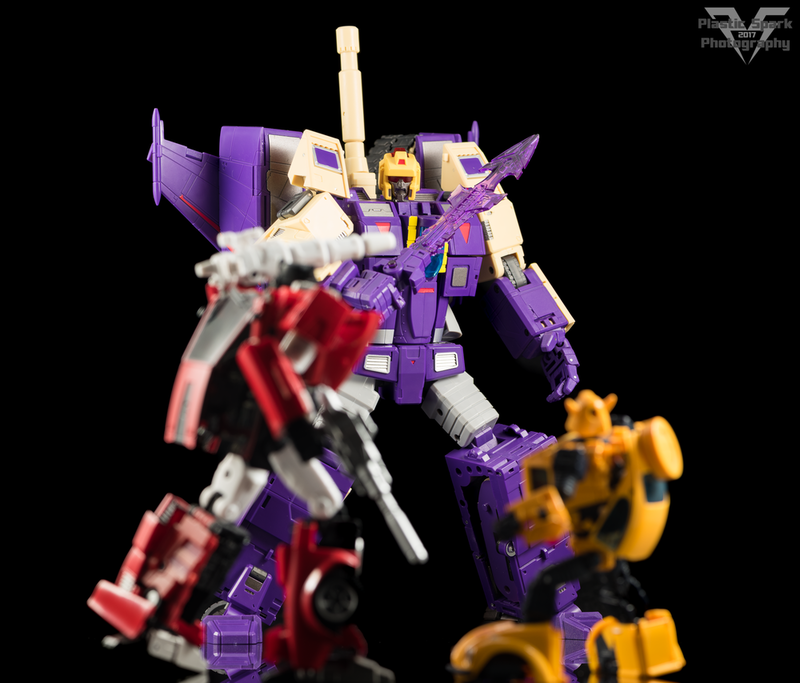 Megatron’s brutish triple-changer, Blitzwing, is brought to life in a large Masterpiece-style size by DX9 with their monstrous Gewalt. This triple changing behemoth towers over any of my existing MP figures and cuts an incredibly imposing silhouette. With his ability to transform into a robot, jet fighter, or tank, he is prepared for combat on almost any terrain. Just don’t ask him to swim! 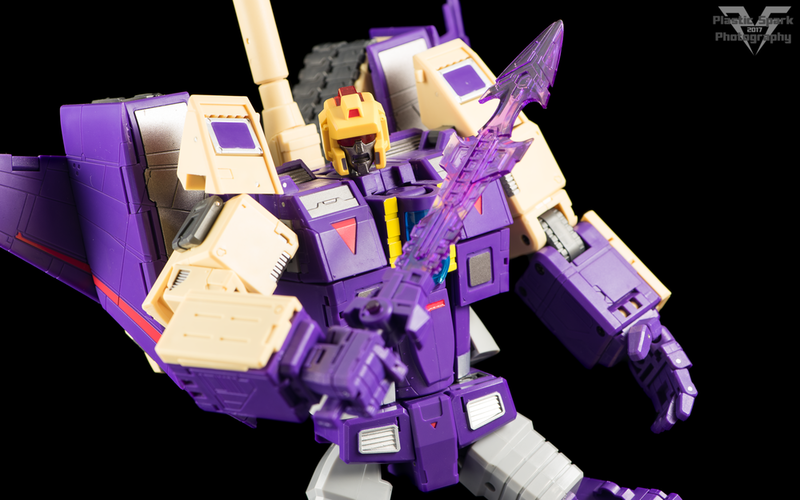 The market is starting to bring a lot of options out for fans of Blitzwing, so let’s take a look and see what sets DX9’s Gewalt apart from the competition. Gewalt’s first vehicle mode is his Tank mode. This is how he arrives in the package, and the first thing that hits you is just how truly massive this figure is. The tank mode is blocky and heavy, with a solid fit and finish that feels great in hand. Aesthetically speaking this is absolutely a cartoon tank, with some less than concealed jet and robot mode kibble. Given his panel heavy design I feel like an extra armor panel on the front, to cover his jet kibble and bot head, and maybe a couple panels in the back, to close up the giant holes he has on either side, would have gone a long way in improving the overall look. Despite his MP-alike size class I feel like the aesthetic is incredibly on point for a classics/generations style collection, kibble and all. This aesthetic choice is something that resonates throughout this piece in all 3 of its modes and I’ll be touching on it more later on. The tank is functional in all the ways you’d want a toy tank to be. The turret can rotate 360 degrees and the cannon can swivel up and down. There are wheels on the underside of the molded plastic treads that facilitate a rolling action on smooth surfaces if you like to zoom your tank around. You can also unfold the wings from the rear section if you want to make a 4th, incredibly silly secret mode; Wing Tank! There are peg holes on the top of the tank to mount/store the sword, but nowhere to mount the blaster. I would have expected some kind of peg hold on the turret so it could be added as an obnoxious purple auxiliary weapon. You can shove the gun in one the gaps in the rear if you absolutely need to store it. That’s about it for tank mode, but honestly I don’t know what more you could possibly expect, it’s a solid brick of panel filled goodness. Onwards and upwards to Jet mode! The conversion to jet mode from tank is incredibly fun and intuitive. During transformation to any of the three modes I only had to refer to the instructions once, to figure out exactly how his shoulders converted without risking damage. This figure is currently on loan to me from a local collector and the last thing I wanted was to potentially damage Gewalt while handling. The jet mode shares its land based variants blockiness and sheer massive size. There is a long flat plank making up the majority of the top of the jet, with the main wings set very far to the rear of the vehicle similar to the original G1 toy, and the MiG fighter jet that the original design was loosely based on. The addition of secondary horizontal tail stabilizers (These were added late into the design process, more on that later.) adds a level of authenticity to the jet mode, while pulling away from the original G1 design. The overall blocky shape and toyetic design again pulls me towards classifying this toy more as a large classics style figure rather than a suitable Masterpiece spot filler. As a toy, the flat look doesn’t bother me but if we are looking for MP style alt mode accuracy, with aerodynamic curves, it’s definitely a no go when compared to, say, a Masterpiece seeker like MP-11 Starscream. Functionality is limited in this mode to adjustments to the horizontal and vertical stabilizers, as well as the wing flaps. Deployable landing gear is also featured. Much like Tank mode, the only storage offered is for the sword. It can be mounted on the bottom of either wing for supersonic jousting. Here’s where we get into the real meat and potatoes of Gewalt. Everything I adore about this figure, and a few things that I don’t, are here in the bot mode. First off, let’s get the aesthetics out of the way. My statements for both alt modes ring true in bot mode as well, with Gewalt looking like a healthy hybrid of animation model, G1 toy, and modern classics/generations stylings. In particular I find Gewalt to be a near dead ringer for the character model presented in the Transformers: Devastation video game. I absolutely love the way he looks, towering over Autobot and Decepticon alike with a menacing and aggressive silhouette. I think aesthetically he could fit into a Masterpiece display if you want him to, but with his blocky, toy styling, he will stand out like a sore thumb. A gorgeous and imposing thumb, but sore nonetheless. I prefer to look at him as a massive, hulking warrior in a Generations display that Megatron sets loose when he absolutely needs to stop the Autobots cold. If I had the space to dedicate to a Transformers: Devastation display this would be the perfect home for Gewalt. Remember when everyone was painting cel shaded custom Devastation style Masterpieces? Articulation on Gewalt is impressive. From the top down he’s got restricted ball joint neck that can be tricked into a few different poses using the “extendo-neck” transformation joint. This joint can be frustrating to work with, and feels like a bit of a compromise in its design. This is the only piece on this entire figure that causes me to raise an eyebrow design wise, and causes me concern over its long term survival as it is incredibly inelegant in design and implementation. Universal ratcheting shoulders, double elbows, and ball jointed wrists make almost any upper body pose achievable. The only thing I was unable to do was have him hold his, admittedly one handed, blade with 2 hands. He can easily reach across his body to hold his blaster with both hands. His hands are articulated with 2 points of articulation on the thumb and fingers, with the middle, ring, and pinky finger all molded in one piece. From some angles Gewalt’s hands look like massive mittens but after spending a bit of time learning the nuances of their design I found I was able to get some very natural looking poses out of them. The tab and slot functionality to hold Gewalt’s weapons also works incredibly well here, better than any other figure I own, official or third party. Gewalt has a ratcheted waist swivel, with a great natural range of movement. Enough to add personality and realism to his postures, but not enough to break the sculpt and natural lines of his body. The waist swivel may be slightly hindered depending on how you prefer to store the nosecone tips. I had mine pointed up towards the chest so there were no issues with clearance but I could see them getting in the way if you have them pointed downwards, hanging at his hips. Universal ratcheted hips with almost full forward and outward movement, and a mildly restrictive rear swing, coupled with ratcheted double jointed knees and an incredible ankle tilt give Gewalt a lot of options. He can run, he can kneel, and he can give MP-10 a big boot, Kevin Nash style! The front toe portion of the foot may come unpegged in more extreme poses but overall I found the 2 piece foot design of Gewalt to be very smart, and easy to use. "Bah Gawd! Somebody stop the dayum match!!!" Now, on the topic of the legs, you might notice that there aren’t any solid places to tab, fold, or clip the rear stabilizers into on Gewalt’s legs. 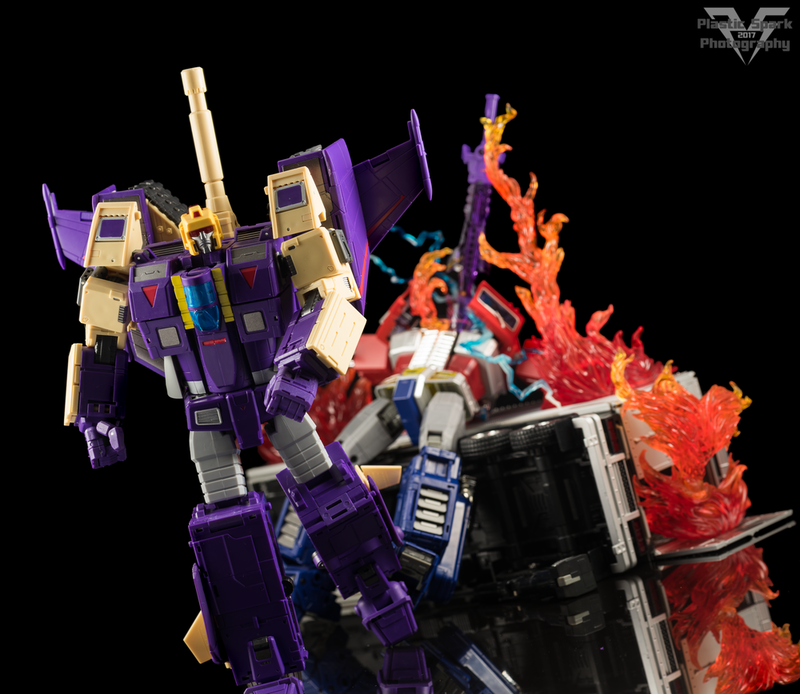 This is due to a late design change prior to release where DX9 decided to add the purple horizontal stabilizers. Due to this last minute addition, there is no way to fold the vertical stabilizers flat against Gewalt’s calves as instructed. I found that wrapping them around the horizontal stabilizer works, although it adds a curved silhouette to his leg that doesn’t mesh with the rest of the figure. Personally I prefer to fold the vertical stabilizer back, and notch the top outwards to match his wings. This keeps the straight lines and blocky aesthetic consistent throughout. 1x Sword – A brilliant translucent purple sword, with incredible detailing and sculpting. The sword looks absolutely menacing in Gewalt’s hands with its curved, barbed blade. The sword pegs in to either hand incredibly well. Stores on Gewalt’s wings in bot mode, and jet mode, and can peg into the top of the tank. 1x Blaster – Nothing to write home about. Generic purple blaster matching the styling of G1 Blitzwing’s blaster weapon. Pegs in to the hands well, no storage in any mode. 1x Sniper Rifle – Gewalt’s tank cannon. Separates from the turret during transformation. It can be pegged into Gewalt’s back to complete the traditional Blitzwing robot silhouette. It can also be unfolded into a sniper rifle style blaster with a pop up scope. No dedicated storage in jet mode however it can be pegged in on the underside of either wing. 1x Replacement Face – A shouting “rage face” as I like to call it. This swappable face has a lot of emotion and I really love the expression it conveys, fitting the “Berserker Warrior” nature of Blitzwing. Unfortunately for whatever reason it came out a lot darker than the bright silver of Gewalt’s standard face plate. This makes it incredibly hard to light properly for photography. If this was my personal figure it would get repainted ASAP. The face pegs in very tightly, but with the help of the included transformation tool it can be swapped out without much hassle. I feel like a shallow square peg would have been more user friendly rather than a long round peg. 1x DX9 Transformation Tool – A dark grey piece, that initially looks like some sort of strange blaster/axe weapon. This tool has a thin curved blade to help pry apart tight panels, a hook to help pull up small pieces, or swap Gewalt’s face, and a 5mm peg to help pry out stubborn hands or other 5mm compatible components on other figures. I actually think this is an incredibly useful tool for anyone who transforms their figures regularly, especially if you find yourself at times without finger nails or other tools to aid in transformation. 1x DX9 Chigurh Replacement Hips – Exactly what they sound like. Replacement ratcheted hips for DX9 Chigurh if you have one of the first release figures. New Chigurhs to my knowledge should already have this piece built in. Packaging – It’s so well done that I’m calling the packaging an accessory on this piece. DX9 is the absolute king of third party packaging with brilliant full color artwork adorning the boxes of their D-series figures. There is also an included poster depicting art of Blitzwing/Gewalt included inside. I personally wish it was the same as the art on the box but it’s still a very impressive piece of artwork. I absolutely adore Gewalt, but not for the reasons that I’m supposed, to if that makes sense. 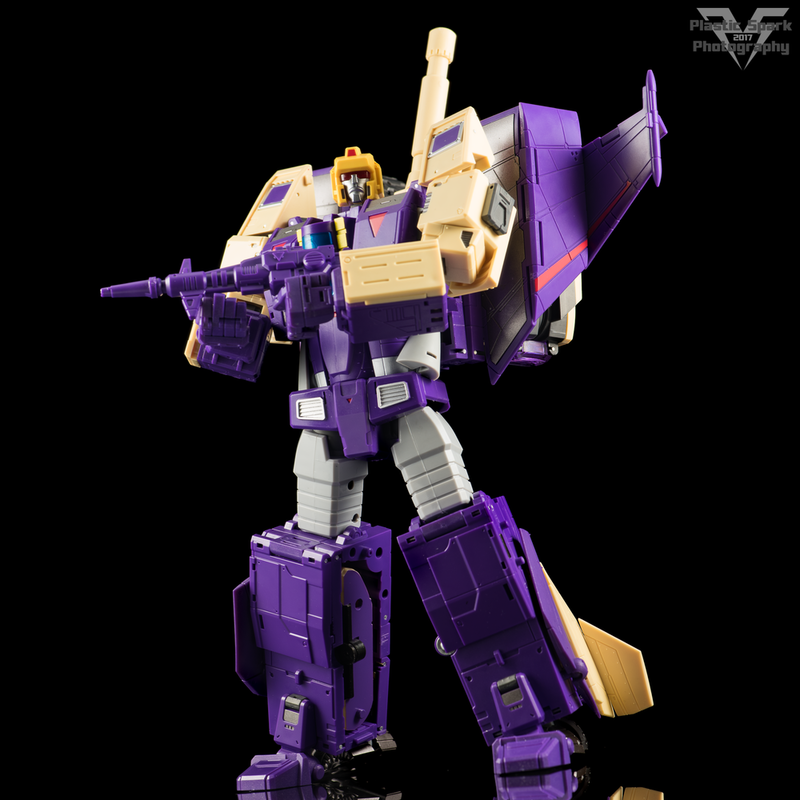 I don’t feel that he is an acceptable “Masterpiece” Blitzwing if your collection is G1 Masterpiece focused but I do feel like he is easily one of the best Blitzwing figures ever made. He fits classics/generations sensibilities to a T, and is the spitting image of the Devastation version of the character. "I'd rather be playing football." He is solid, well built, and incredibly articulated leaving very little wanting. DX9 absolutely knocked it out of the park for me personally on a toy level and I highly recommend this figure to anyone who might be interested. If you want a fun toy, and an impressive version of Blitzwing for your collection, whether to play with or to display, I can absolutely recommend DX9 Gewalt on that basis alone. If you are a Masterpiece focused collector looking to round out your G1 cast in a cartoon or G1 toy accurate design sensibility, then this piece is likely not for you but is still well worth your time if you want to check it out. You might find that you are ok with some of DX9s personal flavor mingling with the rest of your official and third party Masterpiece figures. What do you think? Does DX9 Gewalt fit your tastes? Is this a figure you have, or plan to add to your collection? Let me know your thoughts down in the comments section below, and as always please feel free to send any questions, comments, or review requests to plasticsparkphotography@gmail.com. I'd love to know what you guys would like to see reviewed on this site! See you guys next time!